Summary: Learning that the Confederates were building ironclads at Norfolk, Burnside planned an expedition to destroy the Dismal Swamp Canal locks to prevent transfer of the ships to Albemarle Sound. He entrusted the operation to Brig. 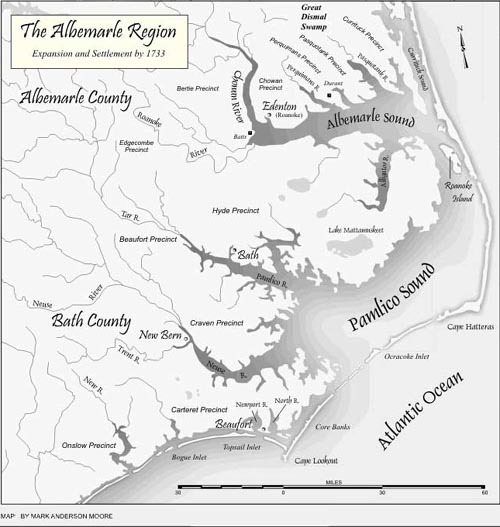 Gen. Jesse Lee Reno’s command, which embarked on transports from Roanoke Island on April 18. By midnight, the convoy reached Elizabeth City and began disembarking troops. On the morning of April 19, Reno marched north on the road to South Mills. At the crossroads a few miles below South Mills, elements of Col. Ambrose Wright’s command delayed the Federals until dark. Reno abandoned the expedition and withdrew during the night to the transports at Elizabeth City. The transports carried Reno’s troops to New Bern where they arrived on April 22. Although the fight at South Mills was the only battle near the canal, wartime activity left the canal in a deplorable condition. Burnside ordered 3,000 men under General Jesse Reno to blow up the locks in order to preclude the chance that Confederate ironclad gunboats might be floated down the canal from Norfolk. The troops landed just south of Elizabeth City on the evening of April 18. Carrying with them two wagons of explosives, the Federals made a strategic error by taking a wrong road and adding ten miles to their overland route north. (They executed the mulatto guide who had misled them.) Weary and robbed of any chance of surprise, the Union troops meet 900 Confederates, commanded by Colonel Ambrose Wright, a few miles below South Mills. 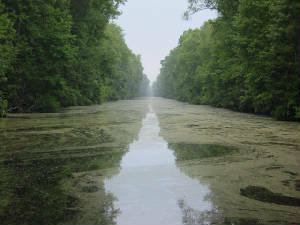 History: The Dismal Swamp Canal, opened to waterway traffic in 1805, became a "prize of war" during the Civil War. In the early months of fighting, Southerners used the canal to transport much-needed supplies. W. F. Lynch, Commander of the CSS Sea Bird, a side-wheel steamer, received naval supplies via the canal when he was in charge of a tiny fleet defending Roanoke Island. After Roanoke Island fell into Union hands on February 8, 1862, Lynch decided to take a position at Elizabeth City. However, on February 10, units of Admiral Goldsborough's fleet captured Elizabeth City and the Sea Bird was rammed and sunk by the USS Commodore Perry. 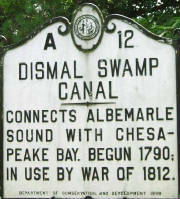 Two other ships fled northward up the Pasquotank River to the Dismal Swamp Canal en route to Norfolk. While CSS Beaufort made it safely through the canal to Norfolk, CSS Appomattox was two inches too wide to enter the locks. Rather than let his ship be captured by the enemy, the captain set it on fire. 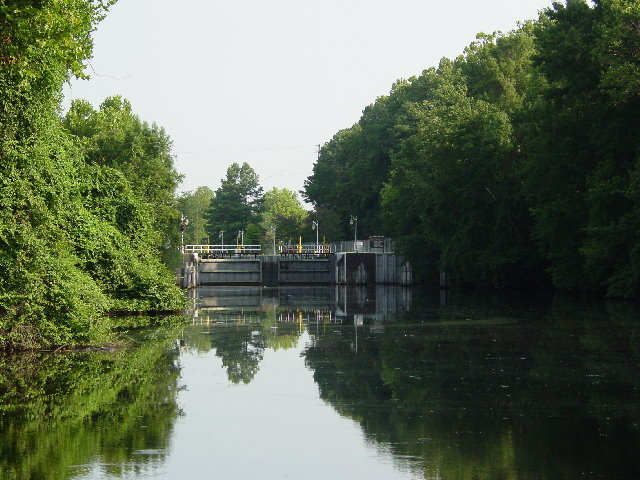 Union forces did not attempt to destroy the locks of the Dismal Swamp Canal until two months later. 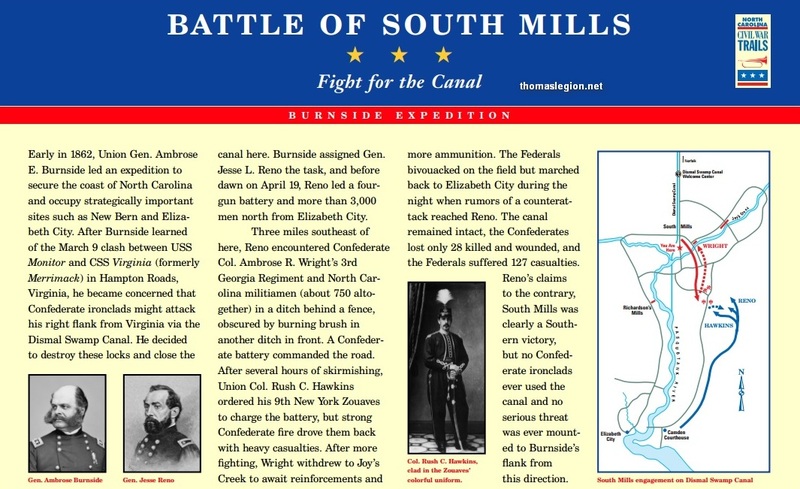 According to The Rebellion Record, Frank Moore, Editor, it was known that "Rebel entrenchments and batteries to protect the canal" had been installed at South Mills. Also, this was the time of the "ironclads," with the battle between the Monitor and the Merrimack at Hampton Roads on March 9, 1862. Word reached General Burnside, who had established a position in New Bern, that Confederates were building ironclads in Norfolk and intended to bring them south through the Dismal Swamp and Currituck Canals. Therefore, General Burnside ordered General Jesse L. Reno to move troops to South Mills and blow up its locks, then proceed to the Currituck Canal and destroy its banks. General Reno moved his command of 3,000 men from Roanoke Island on April 17 and transported them by water to nearby Elizabeth City. From there, they marched north to South Mills, accompanied by three wagons loaded with explosive materials to be used on the locks. 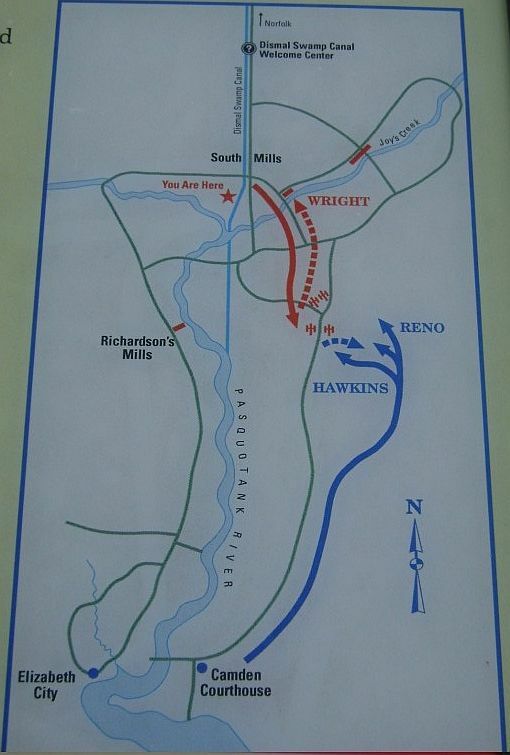 After an exhausting all-night march, at noon Reno's men encountered the Third Georgia Regiment, commanded by Colonel A. R. Wright, about three miles below the locks. The two sides engaged at the edge of the woods at the north end of Sawyers Lane. On April 19, for five hours, the 750 defenders withstood all Union assaults until their artillery commander, C.S. Captain W. W. McComas, was killed. Running low on ammunition and to avoid being flanked, Wright withdrew his troops to a new position behind Joy's Creek, about a mile away. Unaccustomed to the oppressive heat and after sustaining numerous casualties, the Union forces did not pursue and, in fact, rapidly withdrew back to their transports near Elizabeth City, leaving their dead and wounded behind and the Canal intact. During this time, a sizable number of Confederate sympathizers and deserted soldiers were in hiding in the Swamp, making periodic raids on Federal boats. Official Army records document that on December 5, 1863, Brigadier General Edward A. Wild led forces from Norfolk to South Mills and Camden Court House to capture these Rebel forces. However, the two small steamers carrying supplies for his forces were by "some unaccountable blunder ... sent astray through the wrong canal" and did not catch up with General Wild until he arrived at Elizabeth City. In the vastness of the Great Dismal Swamp, the Rebels eluded this expedition. All settlements discovered on this march were burned and confiscated, innocent men were hanged and women were taken as hostages. North Carolina Governor Zebulon B. Vance referred to General Wild's actions as a "disgrace to the manhood of the age. Not being able to capture soldiers, they war upon defenseless women. Great God! What an outrage!" The Union forces returned to Norfolk on December 24, leaving a trail of destruction behind them. Analysis: On April 19, 1862, Confederate troops repelled Union troops for five hours at Sawyer’s Lane, retreating to fortifications 2 miles north at Joy’s Creek only after being outflanked from the east. 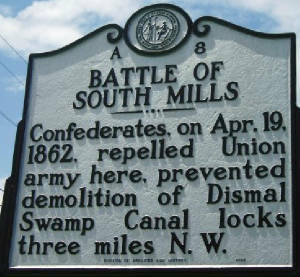 Both sides claimed victory: the North because they captured the field and the South because they prevented the destruction of the Dismal Swamp Canal Locks, 3 miles northwest in South Mills, North Carolina. The Confederate troops retreated north to the locks at Wallaceton in Virginia during the night to prevent being outflanked from the east again. Union forces retreated back to their transports at Chantilly on the Pasquotank River around 10:00 p.m., fearing the Confederates were receiving reinforcements from Norfolk. A Confederate force of about four thousand men was sent from Suffolk through Gates County in an attempt to cut the Yankees off from their ships, but they arrived too late. General Jesse Reno’s Union forces consisted of three regiments from Roanoke Island and two from New Bern. They were accompanied by a detachment from the 1st New York Marine Artillery and underwater explosives expert, Professor Benjamin Maillefert, of New York City. Their objective was to blow up the locks at South Mills, cutting off the major route for supplies to Norfolk and denying Confederate ironclads a route to the Albemarle Sound. The fear of ironclads was unfounded; the canal was far too shallow and narrow for the CSS Virginia’s passage. The Union battle plan called for Colonel Rush Hawkins and his Fourth Brigade from Roanoke Island to land at Chantilly under the cover of darkness, followed by a twelve mile forced march to South Mills. They were to capture and hold the bridge over the Pasquotank River below South Mills, preventing the seven Third Georgia companies posted on the Pasquotank County side of the river from crossing over into Camden County. Reno was to follow with his two regiments from New Bern and the explosives to blow up the locks. (Right) Union and Confederate forces maneuvering for position during the Battle of South Mills. Although this was a minor engagement, it proved that Union forces could now push inland and operate with relative ease against a variety of targets, such as bridges, warehouses, railroads and depots, and the state's infrastructure. In the darkness, Hawkins and his Fourth Brigade took a wrong turn onto Gumberry Road, arriving at Belcross around dawn. They stopped at the house of Lieutenant Alonzo Bell on Lamb’s Road to eat breakfast. Hawkins recognized Bell as one of the paroled captives from the Battle of Hatteras Inlet. After eating, the Union column continued down Lamb’s Road towards South Mills, an unintended detour of about 5 miles. Hawkins blamed the blunder on treachery by his local guide. In the meantime, Reno’s column left Chantilly at dawn and followed the most direct route past Camden Court House, stopping to rest at Lamb’s Corner around 10:00 a.m. While stopped, clouds of dust and flying colors were espied approaching from the east down Lamb’s Road. Reno called his men into line of battle and prepared to fire on the approaching force, thinking Hawkins was already at South Mills holding River Bridge. The supposed enemy turned out to be Hawkins and his worn-out men, several hours late. They fell in behind the fresher troops of the Second Brigade and continued northward towards Sawyer’s Lane. Around noon, Confederate artillery fire halted the Union column. The Union battery was hurried to the front of the column and a three hour artillery battle ensued, followed by an hour of combat between the infantry units. The Union advance was held up by five companies of Colonel Ambrose Wright’s Third Georgia Infantry and three guns of the Giles Light Artillery, a total of about four hundred men holding off over three thousand until outflanked from the east around 5:00 p.m. The Confederates withdrew to entrenchments north of Joy’s Creek; the exhausted Yankees declined to pursue them. The Battle of South Mills was over. On the return to their ships at Chantilly, Union troops destroyed the bridge over Sawyer’s Creek, set prisoners free from the jail, stripped the store of an outspoken Southern sympathizer of its merchandise, reportedly stole the gems of the local Shrine Hall, and used the Camden Court House as a rest stop. The route back to Chantilly was strewn with materials looted during the return trip. Sources: albemarle-nc.com/camden/history/civilwar; southmillsbattle.home.coastalnet.com; National Park Service; NC Office of Archives and History; Official Records of the War of the Rebellion; Microsoft MapPoint.